In what will surely be a constant refrain, a group of pilgrims who apparently don’t understand the notion of letting other people sleep were up, moving and talking loudly much earlier than necessary–the sun is not even up until after 7:00. (I’ll try not to repeat this in writing though I’m sure it will be repeated in daily life). The wine-swilling grocery store owner was up and at it early, providing coffee and Powerade for us dehydrated pilgrims. A short hike today into Pamplona, the town of the toros. The largest city on the way, Pamplona has a walled old town with winding narrow streets, the Castillo square, and a large bull ring. It’s not the time of year for the festival of the Bulls, but it is the semana des pinhos, so all the bars had incredible food (tapas) on the counter. It’s amazing what they can pile on top of a piece of bread, though in many ways the best thing is always the Iberica ham on a baguette. As Bruce reminded me, it is a lot like Virginia ham, a favorite of my father who would have loved wandering this town (though maybe not the trekking part). 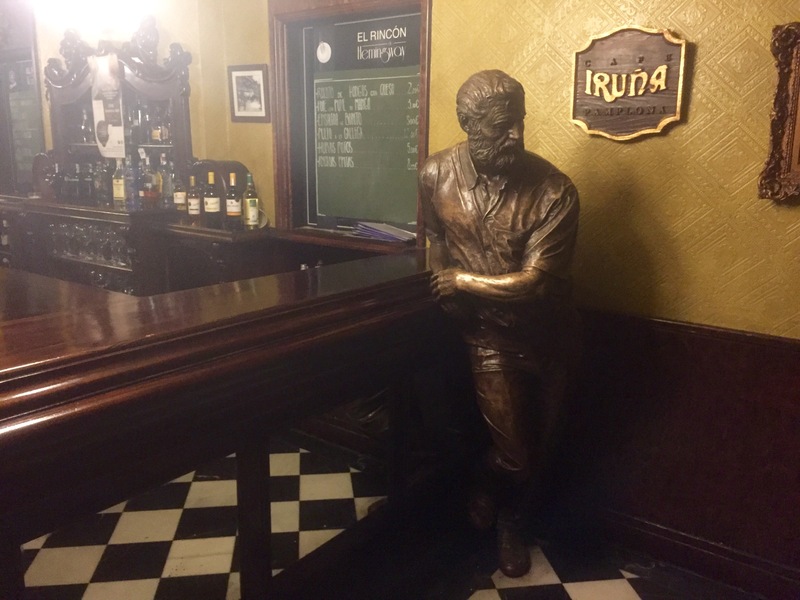 Of course I spent time at the cafe Iruna, a classic 1880s bar with the Hemingway room/statue. Patrick met up with one of his TA friends for a zero day, but only after we had a long couple of coffees on the square. The auberge Paderborn is one of the state owned ones, but is run by a German couple– very hospitable and just off the hill behind the bull-ring. It was an afternoon of strolling, coffee, tapas, and a few beers. Interesting to be in a bustling European city, particularly after 7:00 when everyone is out for their promenade. Late evening I met up with John, my Irish friend, and his German hiker friend Karl-Heinz for a nightcap. He was a retired orthodontist who could discuss the intricacies of Heidegger, quote Rilke, Hoellderlin, and even Poe from memory, and had read most of the great walking books including Fermor and Chatwin. Just an amazingly erudite man, which made for a great conversation amongst all of us end to the day.